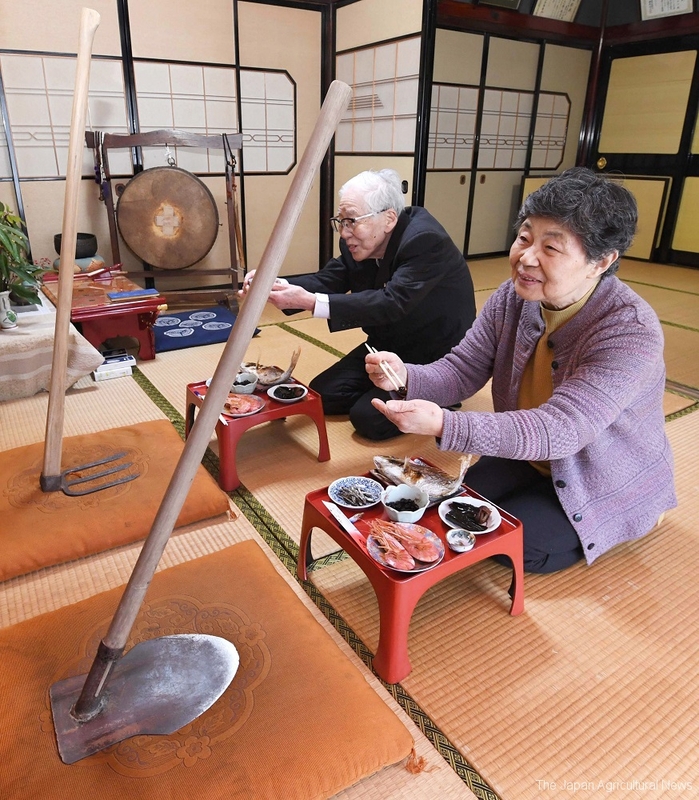 The Japanese couple serve New Year’s feast to hoes to pray for a good harvest year in Toyama prefecture. TOYAMA, Jan. 12 ― Hikohiro Motoyoshi, an 83-year-old farmer, and his wife Hiroko keep alive tradition of serving sake and the New Year’s food to their hoes respectfully. Their hoes — one is flat hoe and the other is three pronged cultivators — are sitting on zabuton cushions, treated like guests of honor, in the largest room in the home of the Motoyoshi family in Toyama. And the couple let their petitions be made known to the hoes for a good harvest and the safety in the coming year. “They have promised me another good harvest this year,” Hikohiro Motoyoshi smiles, after talking to the hoes, a tool designed to remove weeds between crop rows. The ritual dates back the Edo period, or about 380 years in the Toyama farming region. The Motoyoshi is the only family who still keep the ritual every year.